We’d love your help. Let us know what’s wrong with this preview of A Beginner's Guide To Christmas by Jennifer Joyce. Christmas may Festive short story. 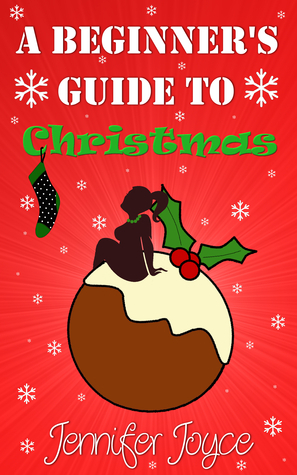 To ask other readers questions about A Beginner's Guide To Christmas, please sign up. This is absolutely hilarious! Ruth provides a handy list of do’s and don’ts for the Christmas season. The funny part comes when she tells you why she came up with the list. Ruth’s mom sprains her wrist and can’t cook the family Christmas meals. When she calls Ruth in to help hilarity ensues. If you want a free book quick book to read then this is worth picking up, but I agree with another review on here that it should be called Complaints about Christmas because that all Ruth does and it didn't have a real ending. I didn't hate this book but didn't love it either. Due to unforeseen circumstances, Ruth has been roped in to a more active role in her family’s Christmas celebrations. Her mother – incapacitated after falling over a rogue toolbox – has been forced to buy presents, entertain guests, cook Christmas dinner and create the perfect festive event. But is the pressure just too much? This book, whilst being short – a half an hour read – is the perfect tonic for those dreading the festive season. There is something about Christmas that fills people with dread. They love the whole holiday spirit and the whole gift giving and receiving and the eating until you get the met sweats but the lead up to Christmas can be fraught with all kinds of unnecessary drama and expense. What Jennifer Joyce does in her story A Beginner’s Guide to Christmas is remind us of all the fun times ahead whilst also offering rather precise interludes of advice. This short story will get you in the mood for Christmas but will also remind you that preparation is the key! Oh my gosh this was so funny. Ruth is facing Christmas at her mother's house and all the Christmas chores are falling to her. The way she tells this story is so hilarious. Whenever anything needs doing her Mom reminds her that her brother has just endured an 8 hour flight and needs to rest. The sheer number of times that is told to her is uncountable. I laughed at her Aunt Pat coming in and insulting them one by one as they receive her. If you want a quick laugh this is the book to read. A wonderfully funny short story, told in diary form, about the mishaps Ruth has while she returns home to her parents' house over Xmas. These diary entries cover a whole range of Xmas nightmares and escapades, my personal favourite involving a supermarket and other people's children. Great Christmas fun. Treat yourself this Christmas to an hysterical short story at family ties over the holidays! How would you react if your mom called and asked for help with the family holiday get-together? Be honest! It's not an automatic yes. Ruthie does the brave thing and not only pitches, but records the experience in a series of helpful, and brutally honest, lessons that are both familiar and funny! A sweet little short story to get everyone into the Christmas spirit. I loved this short book. It made me chuckle when the heroine was obliged to help out over Christmas, complete with someone else's little darlings! This is a quick read - and a fun one too. This is another short Christmas story and as it was free I thought I would give it a try. I was very glad that I did because I really enjoyed it! From beginning to end it kept me chuckling along. Now I just want to read the other two ‘beginners guides’ books by this Author, so that I can read more about the characters! After Ruth’s mum suffers a DIY related injury that means she can’t cook Christmas dinner, it is up to Ruth (even though she doesn’t want to do it) to take over the reigns - with di This is another short Christmas story and as it was free I thought I would give it a try. I was very glad that I did because I really enjoyed it! A laugh-a-minute story starting with the Office Christmas Party – ending up at her home with family, friends, kids, neighbors and having to do everything because her mother sprained her wrist and can’t do what she always did! Truly a comedy of errors and more then fun to read! Made me feel sorry for mothers who are in their 70’s and 80’s still doing all this stuff for Christmas and really never having had time to enjoy it all! The story was much shorter than expected, the second half of the book was used to showcase another book written by Jennifer Joyce, which I cannot complain about because it was a Amazon freebie. The story was pretty humorous and made me laugh out loud on more than one occasion. I would have liked the story to have continued on a little more because it finished a little abruptly and I was beginning to enjoy the writer's style. A quick, christmassy read with humour and relatable characters. The christmas rules that kept popping up (pretty much after Ruth made mistakes or bad calls) were a hilarious touch. I didn't understand the purpose of Gideon or why she was dating him, but the other characters made for a dynamic family. This is a negative, depressing book that defeats the positive aspects of the Christmas season. A fourth of the way into it, it dumped this book not only for its resentful tone, but also for the vulgar language. Maybe you had to be there. Didn’t do anything for me. What a wonderfully funny little Christmas read .. We follow Ruth in an idiots guide of How Not to survive Christmas .. Some really great laugh out loud moments, like 'He's been on a plane for 8 hours' as an excuse for her brother ..
Quick read to get you in the mood for the Christmas season, whatever your role, but especially if you're a scrooge. This will also jump start your preparations, if you haven't already begun! Could be about any family event--Thanksgiving, reunion, etc. After Ruth's mom ends up with her arm in a sling, Ruth has to step up and manage the Christmas celebrations at her parents' house. And Ruth's mom refuses to cancel any of the annual plans. A young woman returns to her family home for Christmas only to find everything going wrong. This is a very funny look at the misadventures of a young woman who is unprepared for handling a family Christmas. From having to cook the family dinner despite her lack of cooking skills to babysitting rambunctious nieces and nephews to handling rude relatives, this poor young woman doesn't have a clue on what to do. And she can't seem to get any help from her family or her boyfriend. Ruth arrives at her parents home to find she has to do all the shopping, cooking and entertaining as her mother has a sprained wrist. Her irritation at the situation and the way she copes with the holiday made me smile. Ruth 's character is very believable and resonates with me. I enjoyed this as a quick read and the taster of Jennifer Joyce's next novel, a beginners guide to salad, which follows Ruth's trials and tribulations a couple of months after Christmas. I'll put that on my reading list n Ruth arrives at her parents home to find she has to do all the shopping, cooking and entertaining as her mother has a sprained wrist. Her irritation at the situation and the way she copes with the holiday made me smile. The title of this book should be complaints about Christmas since that is all the main character did. From start to finish. Thankfully this book was a shot story so it wasn't as painful to get through as it could have been. I really did not enjoy this book at all. It was like watching a spoiled brat complain about everything she had to do, though she should be thankfully to be able to help. I liked it right until the last page. The ending was abrupt and disappointing. However, I then read an excerpt to the authors next book "Salad..." And I am keen to read that too. I like her writing style. Good quick read. Funny & think about moments. We have all been there or done that. Worth reading near Christmas. Not comical but full of pent up resentment and depressing. I'd avoid if I were you. Another Amazon Christmas freebie. Hey, it was Christmas and the book was free. I liked the cover and the format of the book. Not sorry to not have spent 0 dollars on it. What a fun book. This really made me laugh and I was agreeing with her guide rules. I thoroughly recommend this short story to everyone. The list was fun. Ruth is sweet at heart. She's on the large size. Anyone that's been there knows her life. But want to read more of her. This is such a funny little story. The writer's great sense of humor shows up throughout the writing. I recommend it. You can keep up to date wi I'm a writer of romantic comedies who lives in Manchester with my husband and our two daughters. I've been scribbling down bits of stories for as long as I can remember, graduating from a pen to a typewriter and then an electronic typewriter. And I felt like the bee's knees typing on THAT. I now write my books on a laptop (which has a proper delete button and everything).